Since 2012 Blockupy has been the central actor of crisis protests in Germany. Furthermore, Blockupy gained importance as crucial point of reference across Europe for resistance against austerity and for democracy. However, the European “coup” against Greece this summer demonstrated that our political and social impact has not been enough – as that of other alliances and actors – to intervene effectively into the power relations and to achieve some political change. Indeed, a simple “keep going“ cannot be a way for Blockupy to go. At the same time we know that the neither the phase of austerity nor of authoritarian, anti-democratic governance are over – whether in Portugal, Greece, Germany or in Brussels on the EU level. But we also know that struggles against all these impositions continue to be fought. They might receive less public attention and do not have the momentum we wished for. However, they exist and many people continue to connect these different struggles, search for common cleavages and crystallization points that could serve – as happened within Blockupy for some time – as nodal point for different struggles. Over the last months we have experienced an intensification of migrant and refugee struggles claiming their right to freedom of movement. Across Europe, new activities of transborder and practical solidarity have emerged. They demonstrate that the fight for a Europe from below is far from over. “Equal social rights for all“ has been an important demand in Germany for many years, which confronts the systematic destructive dismantling of social infrastructure. The so-called “debt brake“ (constitutionally fixed prohibition for municipalities and states to take on new debt) as well as the diktat of the “black zero” (even budget) are supposed to fix austerity for all future. But the many local and transborder initiatives hold the potential for a break both with the border regime as well as with the austerity dictate. They serve as a sign of hope for new dynamics and a possible transition into a different, more open society. For all these reasons it is time to deliberate on our future strategies and possibilities for intervention with all previous Blockupy activists and future partners in the fight against austerity and for a different Europe of democracy, solidarity and social rights. Together with you we want to look at the constellation of “our enemies” as well as how the “oppositional forces“ relate to each other. We want to deliberate on potential links between democracy and social justice, between local and Europe-wide struggles from below against the old and new austerity and border regimes. What can we be and become as Blockupy? What are our tasks as Blockupy against the backdrop of our experiences and competences? Where are possibilities to enlarge the alliance, where do we see potential moments for political intensification and joint activities? We want to come together for a weekend of two-day deliberation to discuss, gather, unfold and bundle perspectives of analysis and to develop perspectives for action. The first day (Saturday, Feb. 6), shall serve to gather and assess different perspectives. We want to avoid abstract debates, but rather try to clarify where we – starting from our Blockupy experience – see political momentum and potential; which crystallization points could provide a point of reference and frame of action for Blockupy (and beyond). These debates will take place in the plenary and later be deepened in five panels. Saturday should enable us to use the second day (Sunday, Feb. 7) to discuss the strategic direction and future perspectives for action as well as to ultimately identify the next steps together. Here we do not want to pressure us to decide on the next “Blockupy event“ with a clear-cut character, location, date and choreography. However, we would like to outline directions and necessary steps for the alliance. A public panel discussion on Friday night (Feb. 5) under the title “Welcome to the heart of the crisis regime – The summer of migration and the social question“ will open the Blockupy discussions to a broader public and participation. More detailed information on theprogram can be found at https://blockupy.org. In order to have good and in-depth discussions that push us forward politically and practically, we are asking you – activists in movements and organizations, in parties and trade unions – to already start discussing those questions (below in more detail) which are in our view crucial for a political stocktaking and development of common perspectives. These questions will also guide the working groups on Saturday and Sunday. Furthermore, we all should keep in mind the question of how to enlarge and “anchor” the process, how to involve more people in political discussions and how a political intensification can look like. We also invite you to send us contributions in advance, which refer to those questions and open up perspectives for Blockupy. Our goal is to produce a reader and to make a selection of texts available online and at the meeting. Please send in your contributions (max. 10.000 characters) until January 18, 2016 to ratschlag@blockupy-frankfurt.org. Of course, we will take care of solidarity accommodation if needed; please send an email to pennplatzboerse@blockupy-frankfurt.org. The meeting will take place at the Technical University Berlin (10623 Berlin, nearby train station Zoologischer Garten and metro station Ernst-Reuter-Platz). You are welcome to have your own information stand there (only by registration and for a fee, more information at https://blockupy.org). We are looking forward to your responses, the meeting and to an open, intense and stimulating debate. Your help during the meeting (translation, set up, etc) is very welcome. 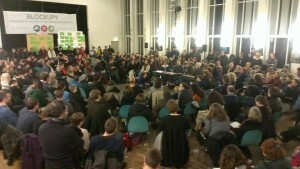 We are happy to answer any of your questions: please contact us via ratschlag@blockupy-frankfurt.org.